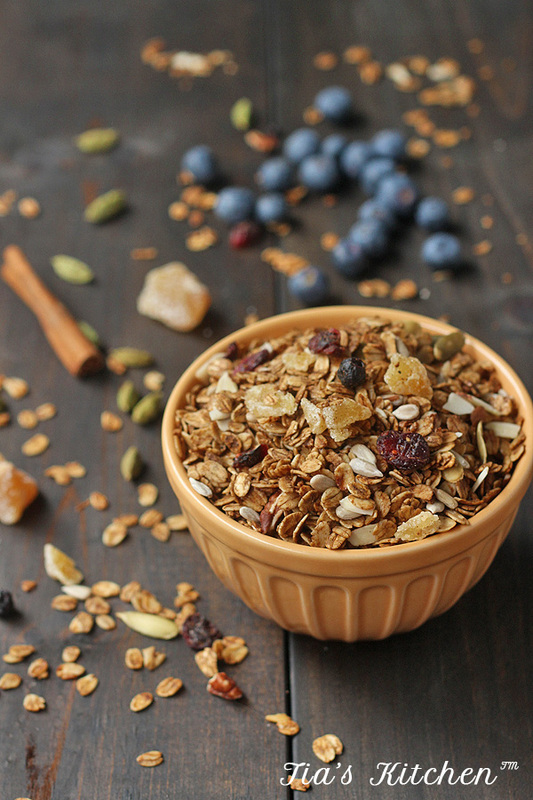 Do you love granola? I mean love, love, love it. Like as much as I do. 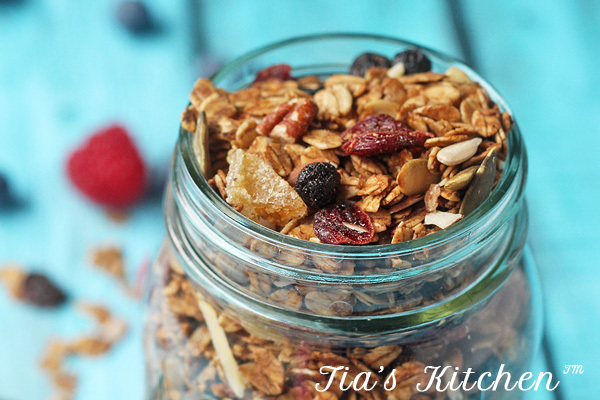 Do you want to make your own granola with this super easy homemade granola recipe? I just never really liked the stuff that came in a bag. Or box. I always had something that I just didn’t like or felt -eh- about. Or weird candies that looked like m-n-ms but tasted completely different. Or dried fruit that you just can’t quite identify. 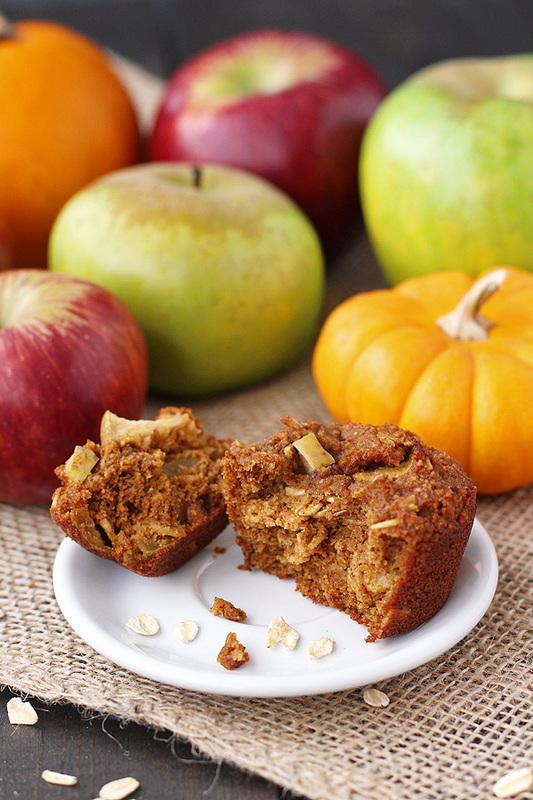 So I would throw a bunch of what I wanted together with butter and sweetener and bake it up. It was quite good just as it was, but I kept learning about nutrition. And how nuts and seeds lose a lot of their nutritional value if you cook them. 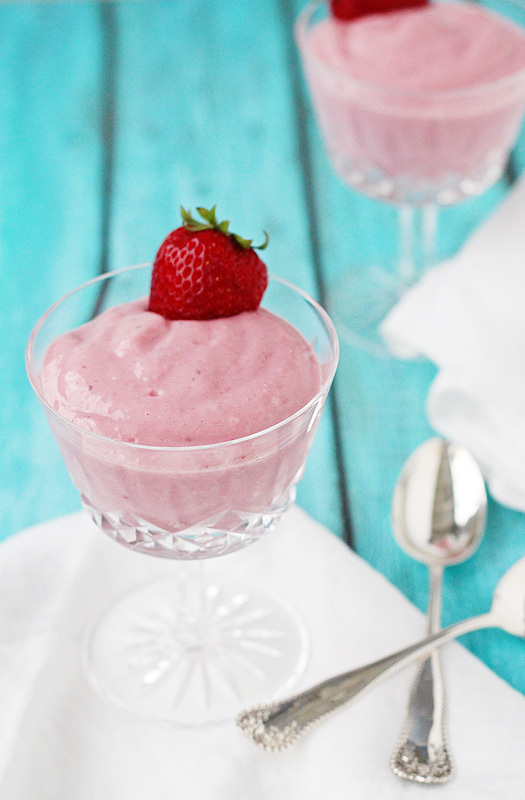 B U M M E R.
Then came fateful day of finding out I was allergic to… well..
How to make one of my favorite snacks in a way that kept the nutrition and still was yummy, yummy, yummy? 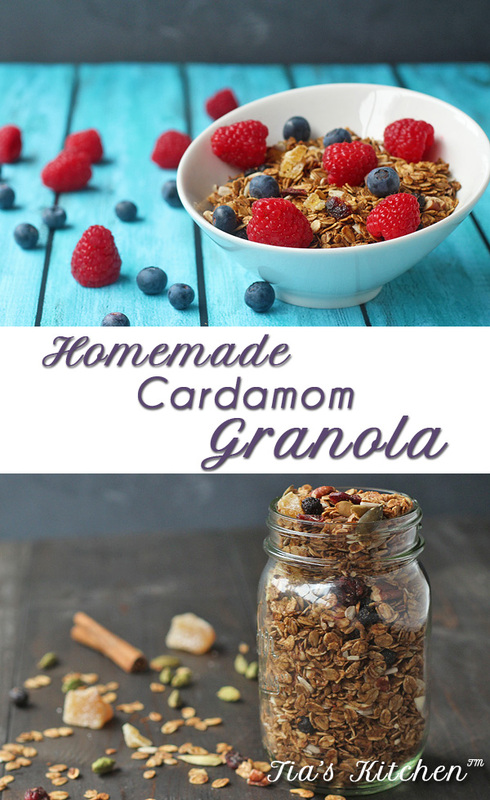 I needed to come up with a revised version of my granola recipe to cover these bases. 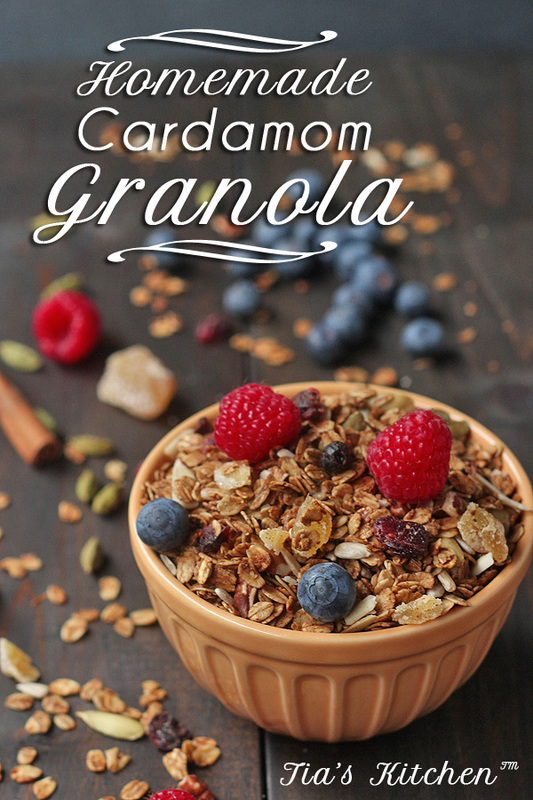 So, below is the Easy Homemade Granola Recipe. It has a little twist with the cardamom. It compliments the maple syrup and molasses nicely. 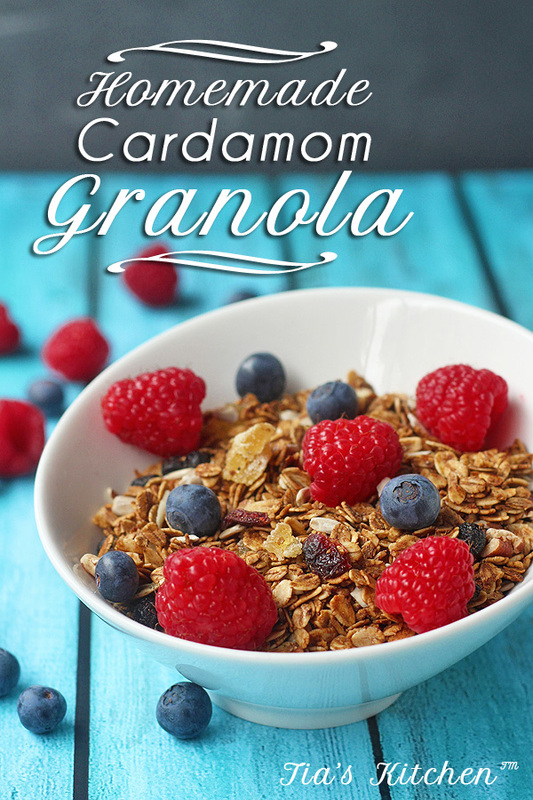 This particular granola recipe doesn’t clump up, since it doesn’t use butter or flour to clump. It tastes just as good. And I am working on some clumping versions because… reasons. Linking this to Allergy Free Wednesdays hosted by Nancy @ Real Food, Allergy Free, Tessa@Tessa Domestic Diva, Laura@ Laura’s Gluten Free Pantry, and Amber@The Tasty Alternative. In a saucepan, melt the coconut oil, maple syrup and molasses. 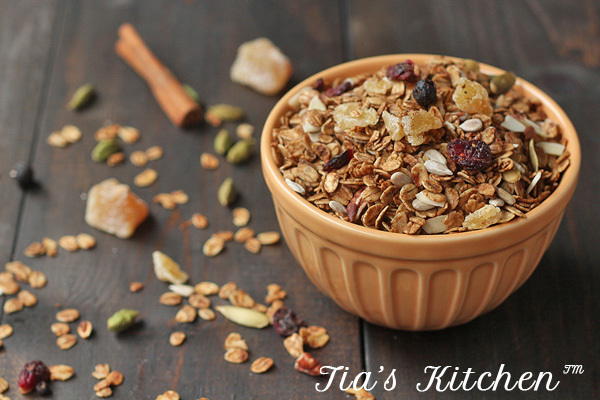 While it is mealting, in a large bowl, add the oats, cinnamon and cardamom. Mix. Pour coconut oil mixture over oats and mix thoroughly. Lay out onto ¼ inch sided cookie sheet. Bake in the oven for 20 minutes. Place back in the oven for approximately 10-15 minutes. Keep an eye on it so it doesn’t burn. While it is baking, wash and dry bowl. Add almonds, pecans, sunflower seeds, pumpkins seeds, blueberries, cranberries and ginger to the bowl. Remove oats mixture from the oven and let cool completely. 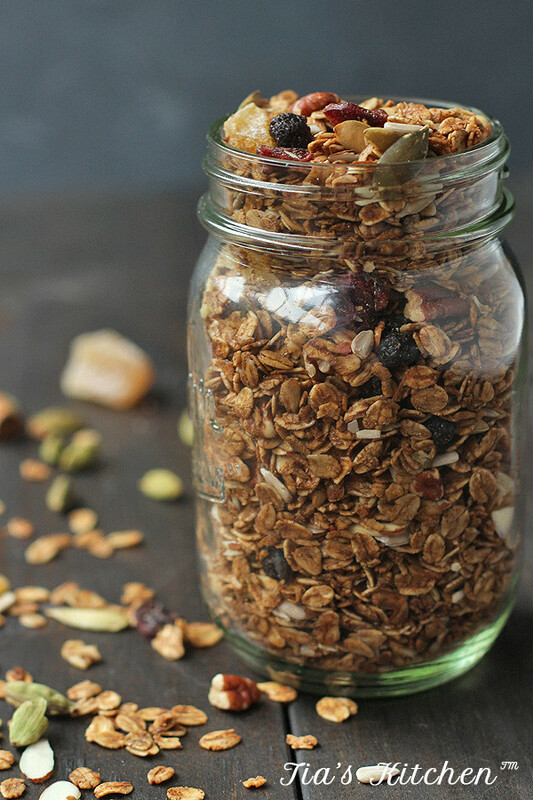 Add oats to bowl with nuts, seeds and fruit. Mix. 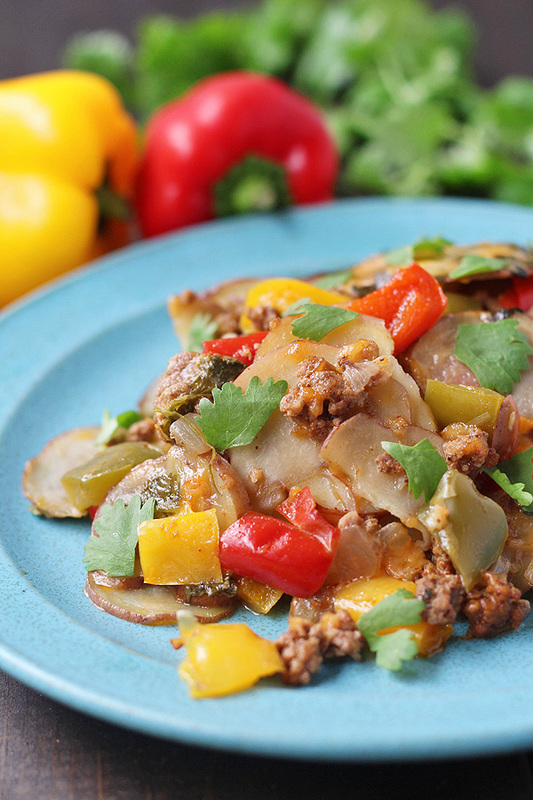 Store in an airtight container for about 1 month in the pantry or 2-3 months in the fridge. Oh man, I LOVE granola. yours looks amazing too!